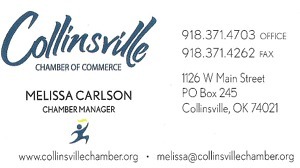 Melissa Carlson is the Collinsville Chamber of Commerce's manager. She is sharing the office at 1126 W. Main with the former chamber manager (Shelley Nachtigall) who is now managing Collinsville Downtown Inc.
Collinsville, OK (January 5, 2015)  The Collinsville Chamber of Commerce is bringing a taste of Hollywood to Collinsville at its Annual Awards Banquet on Saturday, January 31, 2015. The banquet will take place at 6:00 pm at the West Main Event Center at 1011 W Main St in Collinsville. Tickets are $25 per person or $250 for a reserved table for eight. Reserved table sponsors are invited decorate their table using a movie theme. Tables will be judged by those attending the event and the winner will receive bragging rights and a traveling trophy. Individual ticket holders are general admission and we cannot guarantee that large groups of individual ticket holders can all sit together. Back by popular demand will be our live dessert auction featuring sweet treats made by some of the areas best restaurants and home chefs. Be sure and bring your wallet and sweet tooth. To purchase tickets or for more information, contact the Chamber Office at 918-371-4703 or melissa@collinsvillechamber.org.